I’m happy to announce that the new version of Feedwordpress Advanced Filters has just been released. 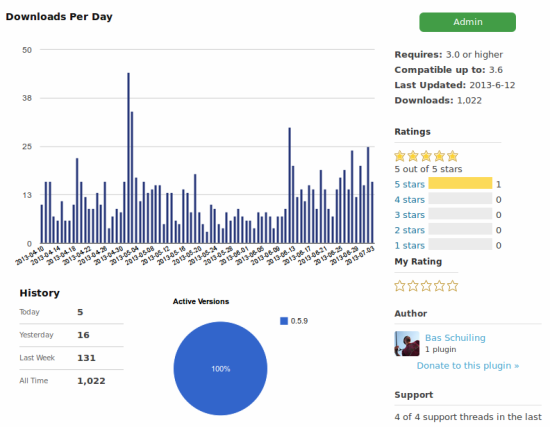 Yesterday I celebrated the 1000th download from the WordPress plugin directory and what better to way to celebrate then releasing a new and better-than-ever version? The last month I spend when I had time to test various functions of the plugin, especially the rather complex image filters. This means most filters have undergone some changes to make them more robust and less likely to fail with strange inputs. Included in this release of Feedwordpress Advanced Filters is the ability to add enclosure images from your feed to your local WordPress installation. Also new is the (beta) release of the link filter. You can set external links easily to target=_blank for opening in a new window. Plus a very simple rewrite function which allows you to set URLs to some local script. Also showing the growth of Feedwordpress Advanced Filters are the emerging of user-built filters around, like this simple filter using regular expressions to remove certain parts of the content, by Frank Mahon. If you made a custom filter please share with us to built a wide feature-set of FAF! For the near future I will be concentrating on making the image filters use the PHP DOM model instead of the regular expression clutter now used for retrieving images. This will also allow for a bunch of new features. The new link filter already works this way. I’m really curious whether this method works on all servers around there. You can help me by providing reports! Talking about the link filter. I’m curious to which Link trackers are widely used around the globe for tracking outbound links. Let me know by commenting ( or otherwise ) and I might support the plugin for tracking URLs. Last, if you have a great idea I should incorporate into the plugin, just let me know. I’m keen to add new features. Today I will be releasing a new version of Feedwordpress Advanced Filters, version 0.5.9. Yes, it’s really close to number 0.6 and initially I was hoping I wouldn’t have to include another release before that, but I have encountered lately a number of important bugs that needed fixing. Most important fix is that in a number of circumstances posts would filter normally when called manually, but would fail when a cron was doing the updating. Another important one is the category keyword filter that would fail when multiple keywords where being used. Apart from that I can announce a few new cool things in Feedwordpress Advanced Filters. On request ( I was pointed in this way by a comment on this blog, thanks! ) it’s now possible to add images from your feed to the WordPress ‘Featured Image’ functionality. It’s now also possible to exclude several images from processing or remove them. To prevent serious bugs from roaring their ugly heads in the feature I’m setting up a Unit Testing infrastructure which I hope will guard the quality of the plugin. Parsing feeds is often a struggle between not being able to control what the input is like ( and often including a lot of garbage ) and needing your output to be perfect. Myself I’m testing with various mutilated feeds to ensure even exceptions are not a breaking point for Feedwordpress Advanced Filters. Help development by reporting weird occurrences, feeds that might not break things and of course if you have cool ideas about what should be included in the plugin; you are more than welcome. I already posted earlier that Feedwordpress Advanced Filters now supports the possibility to add your own custom filters. One of the core features of FAF has always been to be able to easily extend the feature set. With the most recent version it’s easy to drop your own filter into FAF. This post will also serve as the beginning of some public documentation. Feedwordpress Advanced Filters version 0.5.5 has been released. This is mainly a bug fixing release. Important to know is that the option to add you own custom filter is now enabled. I will write about this new feature in a later post. See the changelog for the bugs fixed. You can get the latest version via the WordPress auto-update or download the plugin from the WordPress site. Filter for expiring posts. Posts will be unpublished or deleted after a certain time. Since of course my time is also limited I’m wondering which of these to do first or maybe concentrate on something totally different ( multi-language support for instance ). You can help me by providing feedback of which features you are dearly waiting for by commenting or contacting me. Or just to say ‘yeah’ of course.